Frequently the tool of choice for academics, R has spread deep into the private sector and can be found in the production pipelines at some of the most advanced and successful enterprises. The power and domain-specificity of R allows the user to express complex analytics easily, quickly, and succinctly. With over 7,000 user contributed packages, it’s easy to find support for the latest and greatest algorithms and techniques. 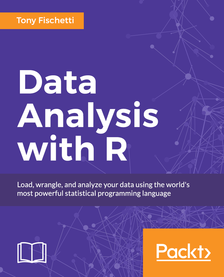 Starting with the basics of R and statistical reasoning, Data Analysis with R dives into advanced predictive analytics, showing how to apply those techniques to real-world data though with real-world examples. Packed with engaging problems and exercises, this book begins with a review of R and its syntax. From there, get to grips with the fundamentals of applied statistics and build on this knowledge to perform sophisticated and powerful analytics. Solve the difficulties relating to performing data analysis in practice and find solutions to working with “messy data”, large data, communicating results, and facilitating reproducibility.